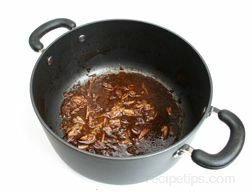 The French term used to describe the residue or particles of food remaining after meat and/or vegetables have been browned or cooked. A fond, which means the same as a base stock, is categorized into 3 main categories: white, brown or vegetable stocks (in French referred to as fond blanc, fond brun and fond de vegetal). A white fond is the base stock remaining from a mixture of the meat and bones from poultry and veal have been cooked with vegetables. A brown fond is the base stock remaining from all of the same ingredients as those used for the white fond with the addition of browned beef. A vegetable stock is created from the particles and stock remaining after vegetables have been sautéed in butter. Fonds, like stocks, are used in preparing sauces and bases that will be added to other foods being made in order to enhance the taste with a deeper and richer flavor.